The million dollar question! Perhaps the most ambiguous, directly avoided topic in our industry... If you ask any adviser how are they compensated and how much, you shouldn't put up with the old "song and dance". 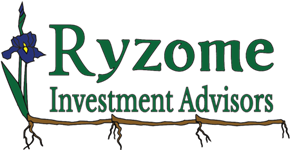 Here at Ryzome, we charge clients a flat 1% fee of assets under management, and bill clients quarterly. So if you wanted to invest $100,000 dollars with us, your quarterly cost would be $250 (1% of $100,000 = $1,000. Paid quarterly equates to $1,000 / 4 = $250. There are discounts for clients with over $500,000. Unlike many other investment advisers, we have absolutely no incentive to make certain transactions, or a certain amount of transactions... Some places charge 5% upfront for mutual funds, with over 1% annual fees on top of that! Other advisers invest with these 1% Mutual Funds and charge their own 1% on top of that. It is very important to us that our clients are familiar and comfortable with the rates they are paying for our services. It takes transparent communication and clear expectations to make sure we are providing as much value as possible to our clients. Ask to see our 'ADV' for more details of our fee structure, or inquire regarding rates of alternative options.